A large part of Wayne County's heritage is farm related, and the preservation of the farms here for future generations is of utmost importance. That is why the UDRBC has chosen to award a scholarship to a graduating senior who has displayed an interest in farming and wishes to continue his/her education in agriculture or an agriculture-related field. 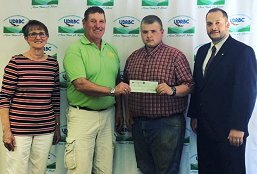 The UDRBC awarded its 2018 Agricultural Scholarship to Tim Brown. Presenting the check to Tim Brown is Ned Lang, UDRBC President who is joined by Betty Sutliff, UDRBC Scholarship Committee Chair and Representative Jonathan Fritz (R-111th). If you have a demonstrated commitment to farming, are presently a Honesdale High School (HHS) student living in Wayne County, participated or are presently participating in 4-H programs and are enrolled in the Future Farmers of America (FFA) Programs at HHS, then we would like to hear from you!